The Strange Towns of the Pine Barrens ~ The History Girl! Written by Paul Evans Pedersen Jr. If you were to look at an old map of the Pine Barrens, you might, indeed, find yourself wondering what could have happened in some of the towns that caused them to be known by such strange and mysterious names. Some of these places are still there, but most exist only in the legends of long, long ago. But one still has to wonder: HOW did these towns get their names? For instance, what in the world could have happened to the folks in "DOUBLE TROUBLE"? What calamity could have taken place in "MOUNT MISERY"? Who or what was everyone waiting for in "LONG-A-COMING"? And what about "OLD HALF-WAY"? Where was it half way to....or half way from? What dastardly deed could have taken place in "ONG'S HAT"? And where is the rest of old Mr. Ong? Who or what, do you suppose, could have sold in "BARGAINTOWN"? Perhaps we could ask "BEVERLY", or "SHIRLEY", or "DOROTHY", or "MARTHA", or "ESTELLE", or "FLORENCE". That is, if they all aren't sunbathing in "LOVE LADIES". And did it have anything at all to do with the "WATER WITCH"? And why would they call a place "CHANGE WATER"? What was wrong with the water they had? What were folks yelling from the banks of "YAWP SHORE"? And what was poured into the river at "SWEET WATER"? Perhaps a bad batch of "CHEESE QUAKE". What, do you suppose, was the relationship between "COCKED HAT", "JENKINS NECK", and "SCULLVILLE"? What, do you suppose, could have be buried in "GREEN BANK", and "RED BANK"? And why did the creek bed sink at "LOWER BANK"? Exactly what kinds of goings-on were taking place in "HOG WALLOW", "HOG THIEF", "CHICKEN BONE", "CAT TAIL" and "MAD HORSE"...and "BUCKSHUTEM"... and "CROWS FOOT"? Who or what met their fate in "DRAGSTOWN"? And who were they chasing in "STOP-THE-JADE-RUN"? Maybe the answer lies under "SHELL PILE". And one surely has to wonder if there is anything other than Capt. Kidd's "MONEY" in "PENNY POT". Yes, my friend, there are many, many strange names of long-forgotten places and towns in The Pine Barrens of South Jersey. One needs only to find an old map...a dark, misty night, and a good imagination to conjure up the goings-on that gave these places their very special names. But...what about old Mr. Ong...and his hat...?? 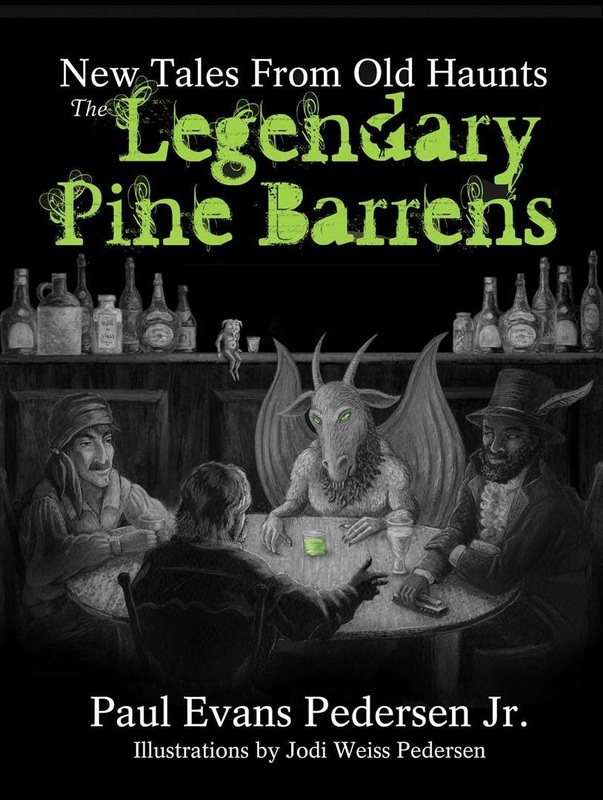 The Legendary Pine Barrens, Pedersen’s second published collection, features twenty-one stories and three songs along with seventeen original illustrations by Jodi Weiss Pedersen. The author introduces a rogue’s gallery of weird and colorful characters in tales that run the gamut from offbeat explanations of natural phenomena, to unconventional takes on popular legends, to strange doings in mysterious Piney towns and taverns. The result is a literary feast for Pine Barrens enthusiasts that induces laughter, reflection, and a number of hair raising moments. Paul Evans Pedersen Jr. is an accomplished songwriter, performer, screenwriter, journalist, and photographer. He has been a reporter for the Hammonton Gazette, Hammonton News, Vineland Daily Journal, and Weekly Retrospect. He has worked as a professional firefighter in both New Jersey and Houston, Texas, and as a volunteer firefighter in Collingswood, New Jersey. Paul is known to South Jersey fashionistas as the inventor and maker of “Pine Barrens Diamonds,” a line of jewelry he handcrafts from antique glass. He lives in Elm, New Jersey, where he is currently working on his first novel. His book, New Tales from Old Haunts: The Legendary Pine Barrens is available through Plexus Publishing.